This photograph has been scaled down; full resolution photograph is available here (740 by 596 pixels). 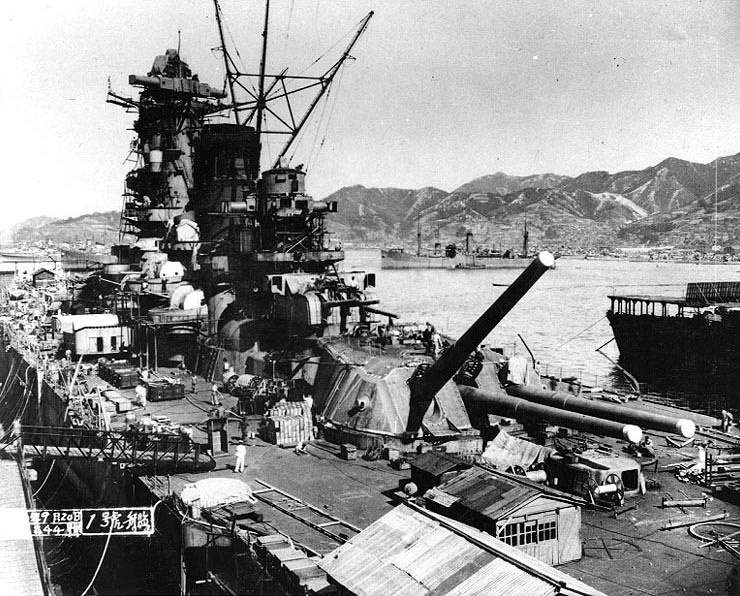 Photo of Yamato as she nears completion early 1941. One of her (18.1) inch guns in 'Y'turret can be seen at maximum elevation. All of the battleships were a source of national pride for their respective nations. Too soon were they all proven to be obsolete, however, by the advent of the carrier. What was the actual color of the Yamato? The Yamato was just the right ship for the wrong war. It had a range of 20 miles with its 18 inch guns, but the aircraft from carriers could go hundreds of miles.